Location of Middleton in Canyon County, Idaho. Middleton is a city in Canyon County, Idaho, United States. The population was 5,524 at the 2010 census, up from 2,978 in 2000. It is part of the Boise City– Nampa, Idaho Metropolitan Statistical Area. On February 1, 2007, 78% of Middleton High School burned down, caused by the overheating of a fan above the weight room. The 42-year-old building was built when fire codes required sprinklers to be installed, but there was no provision for their functionality. To save money during the construction of the school in the 1960s, the sprinklers were installed but were never connected to a water source. Middleton is located at 43°42′23″N 116°37′13″W﻿ / ﻿43.70639°N 116.62028°W﻿ / 43.70639; -116.62028 (43.706353, -116.620228),  at an elevation of 2,398 feet (730.9 m) above sea level. As of the census  of 2010, there were 5,524 people, 1,843 households, and 1,392 families residing in the city. The population density was 976.0 inhabitants per square mile (376.8/km2). There were 2,037 housing units at an average density of 359.9 per square mile (139.0/km2). The racial makeup of the city was 92.5% White, 0.3% African American, 0.6% Native American, 0.5% Asian, 0.1% Pacific Islander, 3.3% from other races, and 2.8% from two or more races. Hispanic or Latino of any race were 10.0% of the population. There were 1,843 households of which 49.5% had children under the age of 18 living with them, 54.7% were married couples living together, 13.6% had a female householder with no husband present, 7.2% had a male householder with no wife present, and 24.5% were non-families. 19.9% of all households were made up of individuals and 7.1% had someone living alone who was 65 years of age or older. The average household size was 3.00 and the average family size was 3.45. The median age in the city was 30.5 years. 35.1% of residents were under the age of 18; 7.6% were between the ages of 18 and 24; 29.9% were from 25 to 44; 19.1% were from 45 to 64; and 8.2% were 65 years of age or older. The gender makeup of the city was 49.9% male and 50.1% female. As of the census  of 2000, there were 2,978 people, 1,017 households, and 755 families residing in the city. The population density was 1,696.8 people per square mile (653.3/km²). There were 1,066 housing units at an average density of 607.4 per square mile (233.9/km²). The racial makeup of the city was 91.67% White, 0.30% African American, 1.07% Native American, 0.24% Asian, 0.24% Pacific Islander, 3.53% from other races, and 2.96% from two or more races. Hispanic or Latino of any race were 10.21% of the population. There were 1,017 households out of which 43.8% had children under the age of 18 living with them, 57.6% were married couples living together, 11.6% had a female householder with no husband present, and 25.7% were non-families. 18.5% of all households were made up of individuals and 6.9% had someone living alone who was 65 years of age or older. The average household size was 2.93 and the average family size was 3.35. In the city, the population was spread out with 34.2% under the age of 18, 10.4% from 18 to 24, 31.9% from 25 to 44, 15.8% from 45 to 64, and 7.7% who were 65 years of age or older. The median age was 28 years. For every 100 females, there were 97.9 males. For every 100 females age 18 and over, there were 94.9 males. The median income for a household in the city was $32,665, and the median income for a family was $34,734. Males had a median income of $27,298 versus $20,792 for females. The per capita income for the city was $12,447. About 7.5% of families and 10.4% of the population were below the poverty line, including 12.8% of those under age 18 and 16.5% of those age 65 or over. The city is served by State Highway 44. It connects to Interstate 84 at exit 25, three miles (5 km) to the west; the city of Star is six miles (10 km) to the east on SH-44. ^ "City of Middleton, Idaho". City of Middleton, Idaho. Retrieved September 2, 2012. ^ "Quickfacts: Middleton, Idaho". United States Census Bureau, Population Division. 2010. Retrieved 2011-12-14. ^ "Profile for Middleton, Idaho, ID". ePodunk. Retrieved September 2, 2012. ^ * Fisher, Vardis; Federal Writers' Project (1938). Idaho Encyclopedia. Caldwell, Idaho: Caxton Printers, Ltd. p. 398. OCLC 962624. ^ "Middleton, Idaho". City-Data.com. Retrieved September 2, 2012. 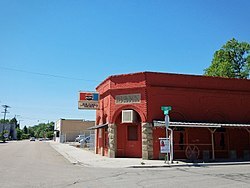 Wikimedia Commons has media related to Middleton, Idaho.